User reviews (formerly referred to as "User comments") are reviews that our users submit to our site directly and are stored locally. See, for example, this index of user reviews for Arrival (2016). Please remember that user-submitted reviews must comply with our guidelines or they may be rejected or deleted. 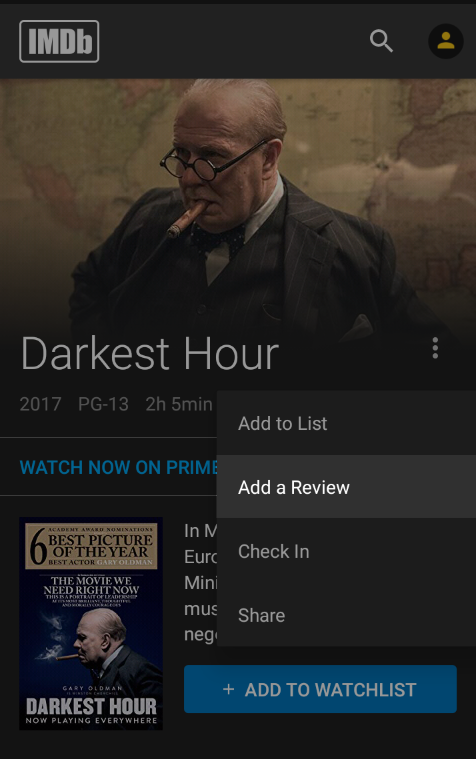 1) Navigate to the title page and click User Reviews listed at the top (you can also click "Review this title" listed near the bottom, just above the "Edit Page" button). 2) On the following page, click the option Add a Review. 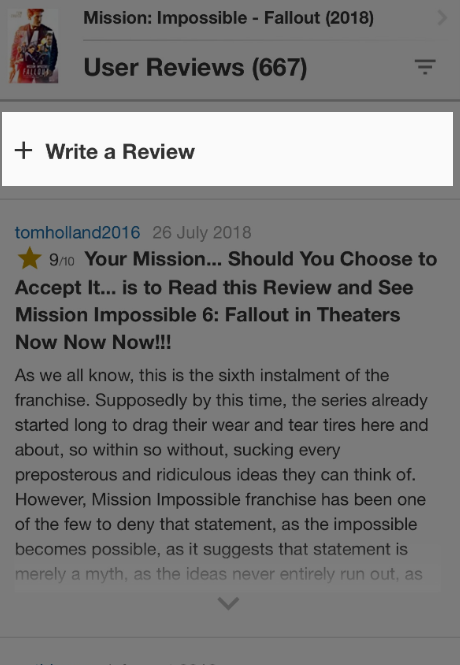 3) You will be presented with a new pane, you can add a review headline, add or edit your star rating, and add a detailed review. Please note whether your review contains any spoilers. Click Submit when you’re finished! 1) Tap the icon next to the Title name and tap Add a Review. (You can also find Add Review links at the top of the "Reviews & Commentary" section, or at the top of the "User Reviews" page). 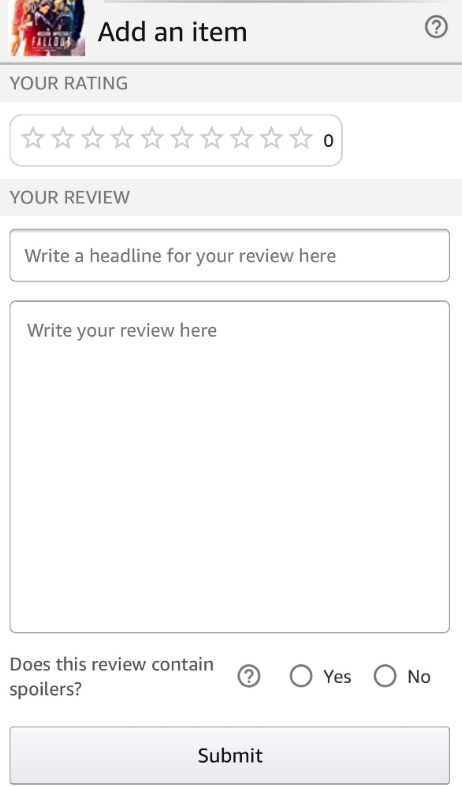 2) On the Submit Review page, you can add a review headline, add or edit your star rating, and add a detailed review. Please include whether your review contains any spoilers. Tap Submit when you’re finished! 1) Tap the icon next to the Title name and tap Add a Review. (You can also find Add Review links at the top of the "User Reviews" section, or at the top of the "User Reviews" page). 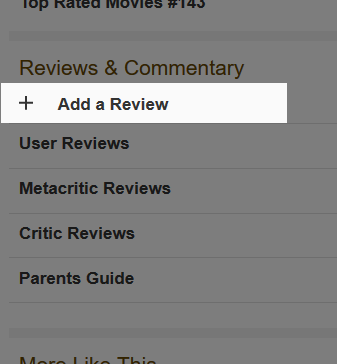 1) Navigate to the title page and click + Add a Review under the Reviews & Commentary section. 2) You will be presented with a new pane. 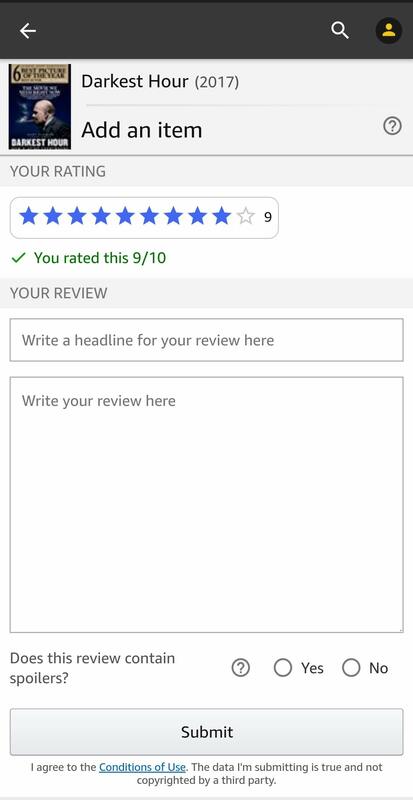 You can add a review headline, add or edit your star rating, and add a detailed review. Please include whether your review contains any spoilers. Click Submit when you’re finished! 3) You can also add a review by clicking User Reviews on a title page, then clicking the + Add a Review link from the top of the page. External reviews, as implied by the name, are reviews (usually from major print or online media organizations) that are stored on other sites. We do not have any control over their contents and simply link to them as a service to our users. For example, see the external reviews links for Arrival (2016). If you are a reviewer or editor or a movie site and your articles are available on the web, you are encouraged to submit links to them. Please go to the title's page, scroll down to the bottom and click the button labeled Edit Page. The new page will include several categories with a box next to each one. To add an external review, scroll down to the Links to Other Sites heading and choose Add 1 Item in the External Reviews section. Scroll down to the bottom of the page and click on the button marked Continue. You will be brought to a new page for the next step. This new page will have two text input boxes. 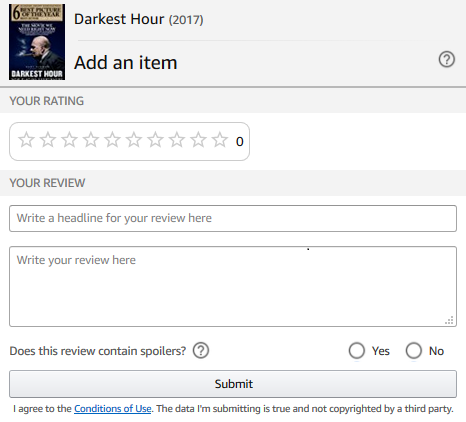 Include the full URL to the review page; under "Description" you only need to enter the site/reviewer name, as the movie title and the fact that it's a review are already part of the submission. Please note that we reserve the right to reject links to websites based on editorial discretion. When you've entered all the information you wanted, go to the bottom of the page and click on the Check these updates button to proceed to the next step. If your data included errors or details that our system believes to be potentially incorrect, the top section of the page will display them. You should see an explanation of what went wrong. You can correct the errors or, if everything is OK, click on the Submit these updates button to send the data to our server. You will need to repeat this procedure for every title where you wish to add an external review link. You can now track the status of your Review submission and if it has not been approved, we'll tell you the reason why.